INFORMATION-SURPRISE Baker Mansion :: The Haunted Wedding Dress. Baker Mansion :: The Haunted Wedding Dress. The Baker's were a quite well to do family in Altoona, Pennsylvania. Elias Baker was a very successful and very rich ironmaster, married and had several children. Elias Baker built Baker Mansion in 1849. He was a very proud and snobby man and dominated his family. When his second youngest daughter Anna intended to get married it should have been a joyous occasion... except the intended groom was one of Elias's laborers and not good enough for his daughter. They argued but in the end Elias won. Anna was not allowed to marry her love and became quite bitter and sad. She had chosen out the perfect wedding dress yet she was never able to wear it. A woman named Elizabeth Bell would taunt Anna on how she would never marry and to top it off it was Bell who wore Anna's dress at her own wedding! Anna Baker died in 1914 and the Baker Mansion, where she had grown up and lived, was leased and later purchased by the Blair County Historical Society. 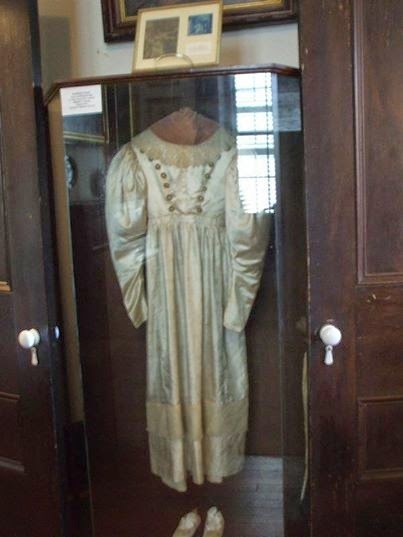 When Baker Mansion was turned into a museum, the dress was placed on display, behind glass, in Anna's old bedroom. Over the years, the wedding dress has gained a reputation for being haunted. Numerous visitors claim to have seen the wedding dress move within its glass case. On nights with a full moon the dress quakes violently in it’s glass case, sometimes threatening to shatter the display. They say that it is Anna’s ghost shaking the exhibit, enraged at the sight of a wedding gown because she never got to wear one. On occasions the dress is seen to move by itself, some say it carries out the motions of someone wearing it and admiring themselves. Could it be Anna Baker once again in possession of her dress, one she was denied from ever wearing?